Loneliness is a major contributor to ill-health both physical and mental. Counselling can assist you to explore options to reduce the effects of loneliness. How about we address the cause? Community-living options allow you the amount of common-space, shared activities and distance that you need. How about you look at some of the options described on Green Fabric Project page? Tour the award winning ‘Green Swing‘ projects in Lathlain: ‘The Siding’ & ‘Genesis’. 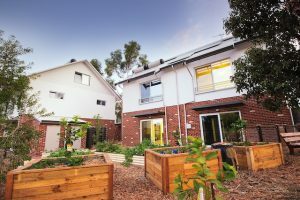 View some of the homes, hear from residents & experience the community gardens. Why not build a community with people who share the same values, and want the same things in a lifestyle? Many older people suffer loneliness because their family move away, a partner dies and they are no longer able to drive or get out and about so easily. They often live on a large block, unable to maintain the garden and buildings and would thrive with a younger family or single people moving into the property. Yes, legal contracts, agreements and building modifications are needed. It takes time with the support and mentoring of experienced community-living advisors but as you will hear from the people who have taken the journey – it’s worth it. Beats loneliness. Most importantly, the stress is managed by using collaborative processes to support everyone to have their priorities taken care of. Want to just talk with a skilled, understanding counsellor about your loneliness or have an outsider to confide in about the above ideas?